The Global Volcanism Program has no activity reports for Apo. The Global Volcanism Program has no Weekly Reports available for Apo. The Global Volcanism Program has no Bulletin Reports available for Apo. Apo volcano is the highest peak in the Philippines, but its geologic history is poorly known. Apo, which means master, or grandfather, rises to 2938 m SW of the coastal city of Davao and has a flat-topped summit with three peaks. The SW peak of the andesitic-to-dacitic volcano, also known as Davao volcano, is the highest and contains a 500-m-wide crater containing a small lake. The youngest crater is on the northern peak. A line of solfataras rises from a fissure on the SE side that extends from 2400 m to the summit. Apo is one of several volcanoes to which the major 1641 eruption from Parker volcano was incorrectly attributed to, but no historical eruptions are known from Apo. The Global Volcanism Program is not aware of any Holocene eruptions from Apo. If this volcano has had large eruptions (VEI >= 4) prior to 10,000 years ago, information might be found on the Apo page in the LaMEVE (Large Magnitude Explosive Volcanic Eruptions) database, a part of the Volcano Global Risk Identification and Analysis Project (VOGRIPA). There is no Deformation History data available for Apo. There is no Emissions History data available for Apo. 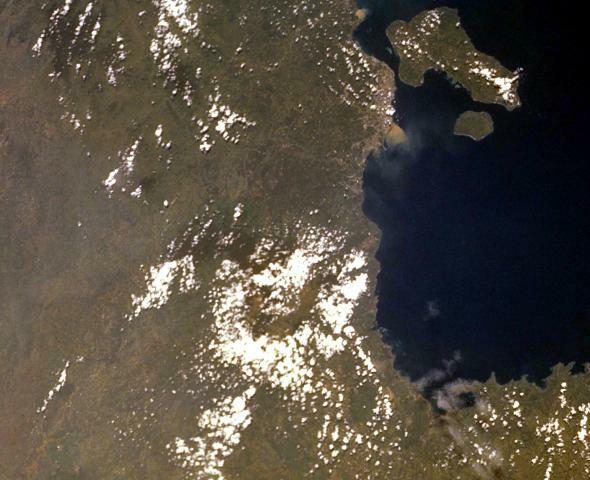 Cloud banks ring Apo volcano west of Davao Gulf below the center of this NASA Space Shuttle image (with north to the upper left). Apo, the highest peak in the Philippines, rises to 2954 m SW of the coastal city of Davao, which can be seen at the upper right, across the narrow strait from Samal Island. 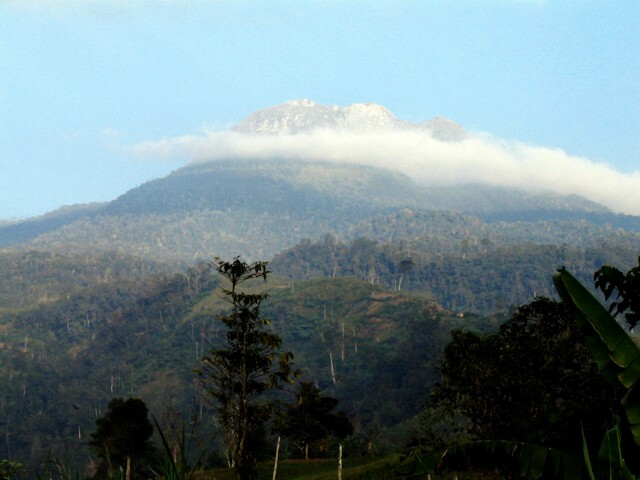 Apo has a flat-topped summit with three peaks, of which the SW peak is the highest and the northern peak the youngest. No historical eruptions are known from Apo, but fumarolic activity continues. NASA Space Shuttle image STS-00-701-91, 2000 (http://eol.jsc.nasa.gov/). Apo volcano, the highest peak in the Philippines, rises to 2938 m SW of the coastal city of Davao and has a flat-topped summit with three peaks. The SW peak of the andesitic-to-dacitic volcano, also known as Davao volcano, is the highest and contains a 500-m-wide crater with a small lake. The youngest crater is on the northern peak of the volcano, whose name means master, or grandfather. Photo by Paul Boscher, 2005. There are no samples for Apo in the Smithsonian's NMNH Department of Mineral Sciences Rock and Ore collection. Large Eruptions of Apo Information about large Quaternary eruptions (VEI >= 4) is cataloged in the Large Magnitude Explosive Volcanic Eruptions (LaMEVE) database of the Volcano Global Risk Identification and Analysis Project (VOGRIPA).